Never one to avoid jumping on a passing bandwagon (especially one that requires new stationery), I started using a bullet journal a few months ago, and have found it a useful, flexible method for keeping track of things. I've used a personal organiser for a number of years as a calendar brain dump, but my to-do lists, time trackers, and mind maps have traditionally been housed on disparate pieces of paper and left in drawers. 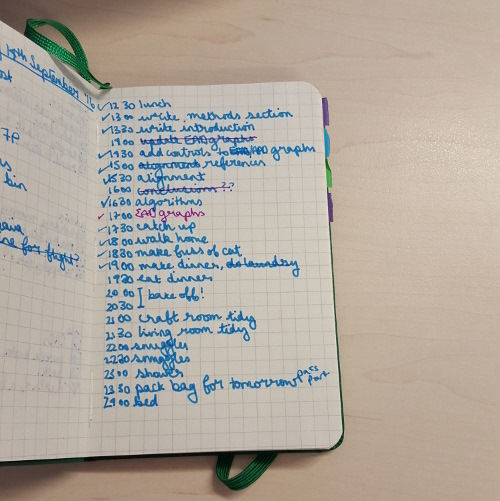 There are a few key parts to a traditional bullet journal: the index, daily log, weekly/monthly/yearly logs, and collections. Some people put in a calendar - I already have a good system, so I haven't added this to mine. The index is pretty simple: you number the pages as you go along and then write down the topics on a page at the back so you can look things up. Usually in a bullet journal, you start everything on the next blank page, so the collections and logs are jumbled up together. I've modified this part of the bullet journal methodology, because I found flipping back and forth too hard, so I've separated out the daily logs and monthly logs from the collections in my current journal. The first 80 pages or so are reserved for daily logs, then 20 pages for blog post ideas and 20 pages for crafts, then some more pages for miscellaneous collections. Starting from the back, there's the index page, followed by my monthly spreads. I don't bother numbering the pages in the daily log, and just start the page numbering in the collections section. The daily log can be a combination of to-do list and diary, but I only use mine as a to-do list, and it is the BEST TO-DO LIST EVER. Previously, at the end of the day, I'd have ticked some things off my list and some things wouldn't have gotten done, so I'd just work off the same to-do list until either all the things are finished or I throw it away and write a new, different list. 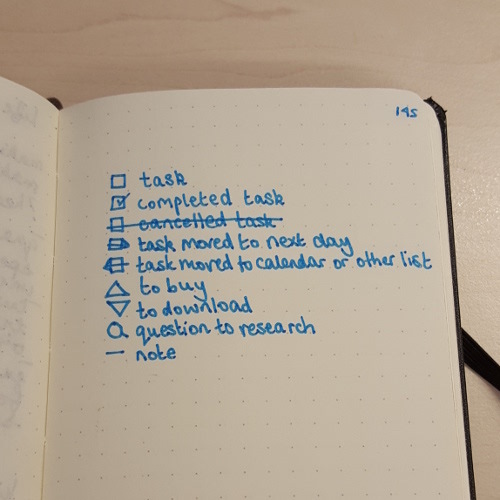 In my bullet journal, I write out the to-do list every morning, and tasks that didn't get done yesterday get migrated, scheduled, cancelled or, if they take less than 5 minutes, done right then. It gives a real sense of finality to be able to look back at old to-do lists without being reminded of an undone task! Re-writing undone tasks is also a good opportunity to ask myself why something hasn't been done - is it the wrong time? Schedule it for the right time. Is there another task that needs to happen first? Put that in the next to-do list. Is the task too big and daunting? Split it up into smaller steps. 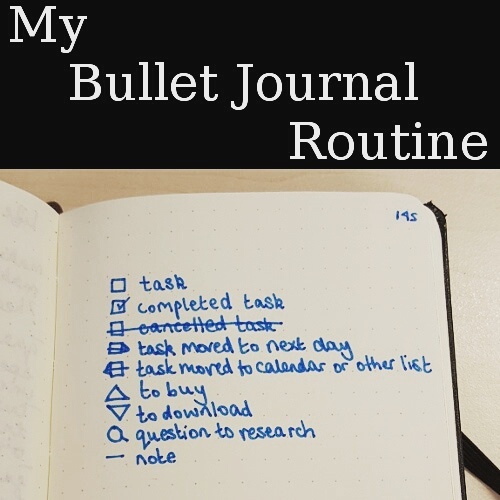 The reason it's called a "bullet journal" is that you use bullets to indicate the status or type of a task. I have bullet variations for completed, cancelled, migrated and scheduled tasks, as well as for things to buy, things to download, things to research, and notes. I don't tend to plan my daily schedule in advance in great detail, but sometimes I feel as though, much like Billy Pilgrim, I have come unstuck in time, and so I jot down my plans for the rest of the day to make sure I know where I am. 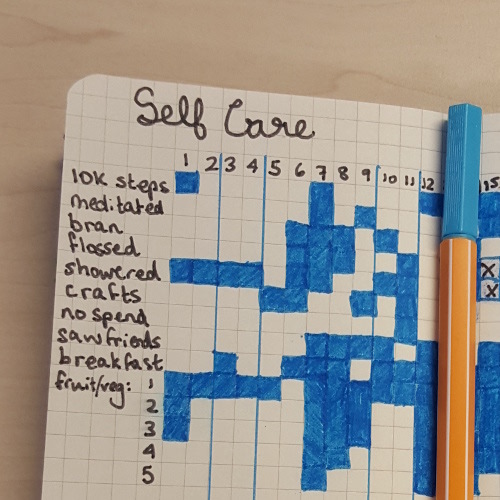 I keep my weekly logs in the same place as my daily logs - they're just a big time tracker to see how much time I've got for science, and to make sure I'm scheduling enough self care activities. I don't make a weekly log every week, but sometimes they come in handy. For monthly logs, I have a habit tracker, a health log, and an exercise log. The habit tracker is a grid with the days of the month as columns and the habits I'm interested as rows - when I've done the thing, I colour in the square. The other logs are just blank pages that I write a line in every day. The health log has been very useful in combination with the habit tracker - hey, it turns out that when I don't eat properly, I get stomach ache! Who knew? Apart from that, your bullet journal can be whatever you want it to be. Some of my pages are just doodles - on one page I have the rules of Galaxy Trucker written down, and on another, a list of all the things my cat is good at. If it's in your brain, put it on some paper, then you can either do something about it or turn the page and let it float past you.